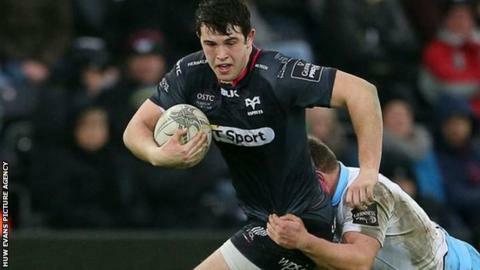 Centre Owen Watkin has signed his first professional contract with Ospreys, agreeing a three-year deal. The 19-year has forced his way into the Ospreys' first team this season, taking his total senior appearances to 10. He also played a leading role for Wales Under-20s as they won the 2016 Six Nations Grand Slam. "I never thought I'd come as far as I have this season, playing for the senior team in the Pro12 and in Europe," said Watkin. "I'm over the moon. I'm really pleased that the coaches have faith in me. "It's hard to believe how quick things have moved on for me since signing my first contract." Watkin played his youth rugby for Bryncethin RFC, Bridgend College and the Ospreys' age-grade set-up, while he attended school at Ysgol Gyfun Gymraeg Llangynwyd.